Aerosmith's show last night (August 5) in South Dakota didn't exactly go as planned. Apparently, singer Steven Tyler was spinning, swaying and grinding the scarf-adorned mic stand when the 61-year-old fell off the stage, forcing him to be airlifted to hospital. Tyler suffered minor head and neck injuries, as well as a shoulder injury because of the tumble, AP reports. The incident took place during a rendition of "Love in an Elevator," a song marred by sound system problems, leading Tyler to overextend himself in order to keep the crowd entertained. "He was good-natured about it," Mike Sanborn, the concert's promoter, told AP. "He was in good spirits when he got in the helicopter. He was talking and joking with the physician. "He does a lot of dancing on the stage and he does a lot of stuff with his mic stand. He put his stand down and twirled around and stepped backwards off the stage." At around 12:15 a.m., Aerosmith guitarist Joe Perry came onstage and told the thousands-strong crowd that Tyler was being taken to hospital and that the show would have to be cut short. However, so far the band has yet to comment on the status of their upcoming tour dates, which involve a string of Canadian shows that begin in Winnipeg on Friday (August 7). 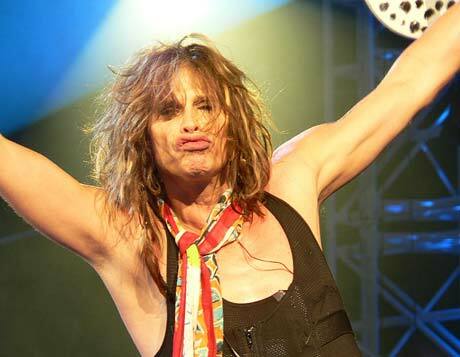 As Rolling Stone points out, this incident is only the latest in a long string of recent Aerosmith injuries. So far on this tour, Tyler has injured his hamstring, guitarist Brad Whitford bumped his head while getting out of his Ferrari and was forced to miss several dates, and bassist Tom Hamilton was temporarily put out of commission due to "non-invasive" surgery.